More than a half-dozen species of freshwater snails are available through aquarium stores, ranging from the brilliantly colored blue and pink ramshorn snails to the common apple snail, which can reach 6 inches in diameter. While most species of snail live a year or two in an aquarium environment, their life span depends a great deal upon tank conditions. The higher the temperature in your tank, the more your snail's metabolism is revved up. While a fast metabolism is desired by humans, it causes snails to progress through their life cycle at a faster rate and die in a year to 18 months. 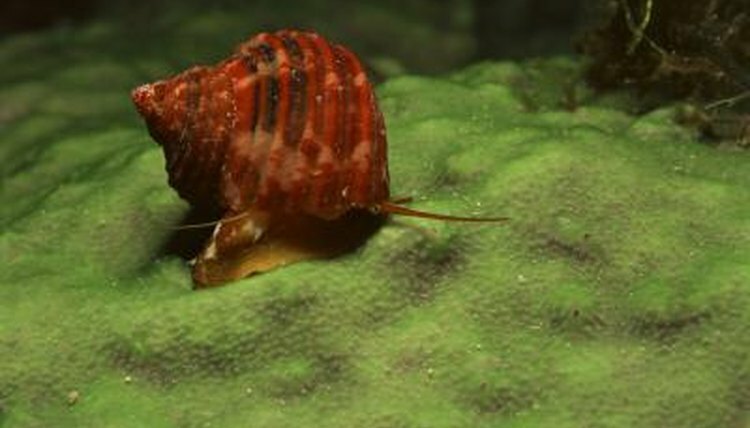 Ideal water temperatures for snails range from 65 to 82 degrees, but aquarium snails will live longer -- between 3 and 10 years -- at the lower end of the scale as their metabolism slows down. Just don't allow the water temperature to drop below 50 degrees, or your snail will die within a few days.